In March of this year the Washington D.C. council passed a bill decriminalizing marijuana, and the mayor immediately signed it into law. City residents had been fighting for marijuana reform for years, although with little to show for their efforts. Medical marijuana was initiated in D.C. in 2010, but recreational use still fell under the harsh federal controlled substances act, which made possession of any amount of pot punishable by up to a year and jail and a $1,000 fine. Finally though the council and the mayor answered the call of two thirds of the city’s population and made simple possession a civil infraction with a maximum fine of $25. But the city government and the vast majority of D.C. residents may have been given a bit of false hope, as decriminalization currently sits in a perilous position. The law must pass through a period of congressional review before it can go into effect, and although that period is ending soon, one motivated Maryland politician has taken steps to block the law from taking effect. Republican congressman Andy Harris, whose district includes the entire Eastern Shore, and parts of Baltimore, Harford, and Carroll Counties, has taken a drastic measure to block Washington D.C. from decriminalizing marijuana by amending a federal spending bill. The District of Columbia relies on the federal government to fund a large amount of its day-to-day functions, including enforcing its laws. So when a congressman from Maryland says D.C. can’t use federal money to enforce a D.C. marijuana decriminalization law, then the law is basically worthless. As of now Representative Harris’ funding modification has not been approved by congress, but when it does pass then decriminalization and legalization are probably both off the table in Washington for the near future. There are a number of questions as to why a Maryland politician would want to block a D.C. law that is supported by so many of the city’s residents. Especially when the politician resides in a state that has already passed a similar law. Representative Harris is on record stating that the decriminalization of marijuana harms children, and he also takes issue with the $25 fine being so low. The argument about the fine might be legitimate, but it surely does not warrant federal intervention. Anytime you bring up the issue of child safety people will listen, but this argument is flawed for numerous reasons. For one, there is absolutely no empirical evidence that decriminalization of marijuana will place children at risk. Harris is quick to bring up the fact that his medical background should make him more of an authority on the subject, but surely he should know that his view on marijuana reform and children’s health is merely a hypothesis. Decriminalization will not affect the way the law treats minors who possess marijuana, and would not necessarily make marijuana more available to minors. On the other hand, decriminalization and eventually legalization will cause the entire black market for marijuana to collapse, thus making it more difficult for minors to obtain the drug. Overall, it is quite frustrating that a Maryland congressman has prioritized meddling with a law that has so much public support in its own jurisdiction. It just seems Un-American for one man with an agenda to override the wishes of the public from afar. But if it’s publicity the representative has actually sought then he achieved his goal, because now a first term representative has his name in the national headlines. The Blog will continue to follow this evolving story and may post a follow up article in the near future. Benjamin Herbst is a Maryland criminal defense attorney who specializes in drug crimes such as marijuana possession and distribution. Md. 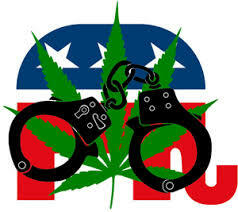 House Republican expected to force vote to undo liberal D.C. marijuana law, washingtonpost.com.